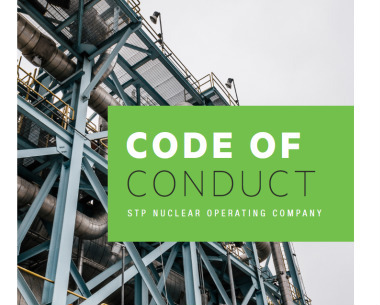 At STP Nuclear Operating Company, we are committed to conducting business with honesty, integrity and fairness. Our Core Values – Safety, Integrity, Teamwork and Excellence – are the standard we hold ourselves accountable to each and every day. Adherence to these values has earned us a high level of trust within our communities and among our owners and regulators. We never take that for granted. Fundamental to that commitment is our Code of Conduct, which outlines the specific behaviors that are expected of all employees. The Code of Conduct establishes clear expectations of what it means to work at STP. The Code of Conduct provides policies and procedures that govern ethical conduct and compliance issues. Use it as a guide whenever you face an ethical dilemma.